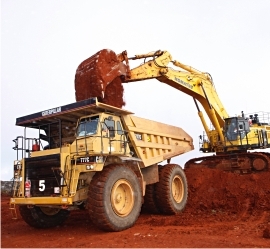 Janet Ivy is an open cut mine that will deliver base-load ore and is located 33km south of the Paddington Mill and 10km west of Kalgoorlie. 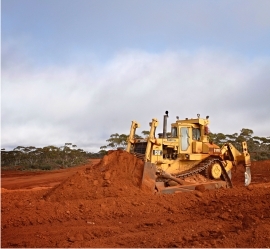 The deposit has a low strip ratio and a dedicated haul road to deliver ore directly to the Paddington Mill. 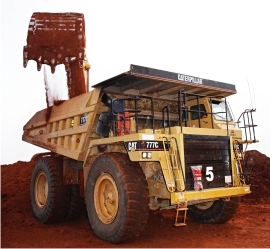 Operations at Janet Ivy recommenced in April 2017 in order to supplement base-load ore feed from the Enterprise open cut mine . 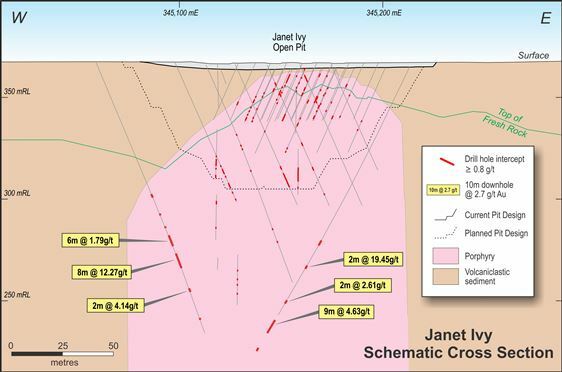 The Janet Ivy deposit is a broad, strike extensive zone of mineralisation contained within a felsic porphyry intrusive. Mineralisation is controlled by a vein stockwork zone, individual fault-controlled veins, and pervasive wallrock alteration of the porphyry. Significant mineralisation extends over a 1.3km strike extent, and to an average vertical depth of 130 – 150m from surface. Mineralisation remains open along strike and at depth. At a 0.5g/t Au ore cut-off grade, Janet Ivy contains a global Indicated and Inferred Mineral Resource estimate of 19.5Mt @ 0.89g/t Au (561,000oz). The estimate is sub-divided into a higher grade component at a 0.6g/t Au ore cut-off grade comprising 10.3Mt @ 1.00g/t Au (331,000oz), and a lower grade component at the 0.5 – 0.6g/t Au grade range comprising 3.31Mt @ 0.55g/t Au (58,000oz). The lower-grade range captures additional material that may be amenable to heap leach and this evaluation is underway. A remaining Probable Ore Reserve of 1.75Mt @ 1.06g/t Au (59,800oz) has been defined as a mill-only scenario (not inclusive of any heap leach potential).